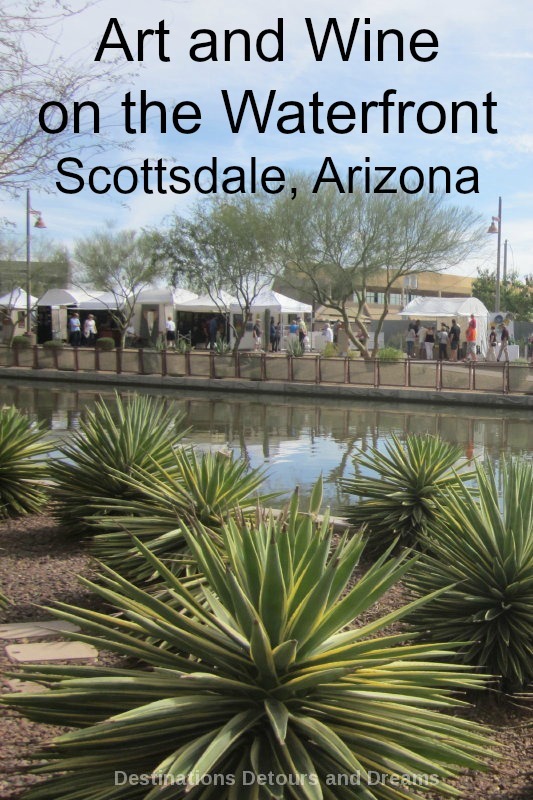 Waterfront Fine Art & Wine Festival takes place in Scottsdale, Arizona takes place in February. Produced by Thunderbird Artists, it showcases quality arts and crafts, wines, and chocolate juried for the event. The Waterfront provides an ideal setting for the event. 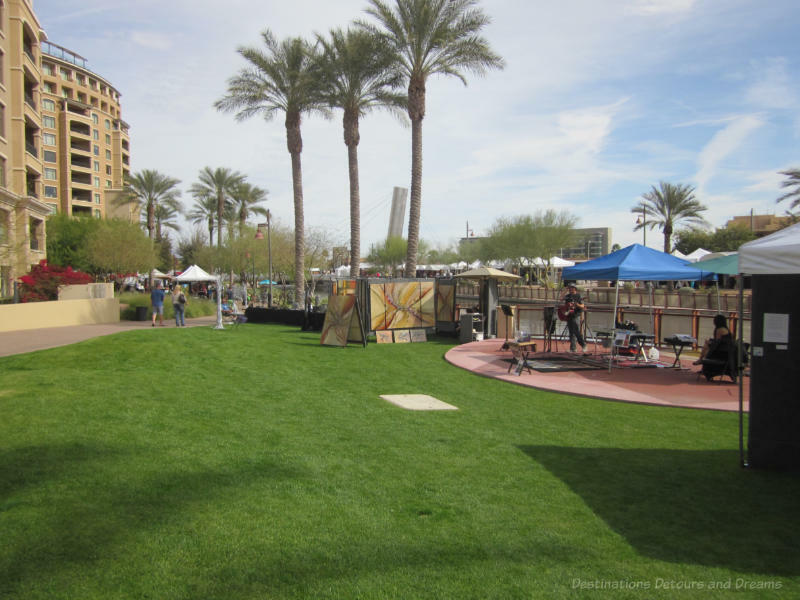 The Waterfront is a revitalized area of downtown Scottsdale built around an ancient canal, part of a sophisticated irrigation system built by the Hohokam Indians over a thousand years ago. Today the banks of the canal are lined with palm trees and other greenery, public art, courtyards, fountains, and walking paths. The area around the canal contains restaurants, outdoor cafés, speciality shops, and high-rise residential buildings. During the Waterfront Fine Art and Wine Festival tents line both sides of the canal. Inside each tent is the work of an independent artist. Sometimes the artist is also there and you can meet and talk with him or her. A few tents house winery representatives. 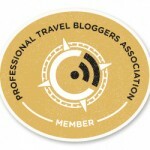 With the purchase of wine tasting tickets you get a souvenir glass. Use the tickets and glass to obtain a selection of wine samples as you stroll through the festival. Musicians are stationed at several spots throughout the festival grounds. When I attended the festival, I saw a beautiful and varied collection of art. Paintings in many styles and a variety of mediums. Photography, bronze and silver statues, jewelry, wood carvings, blown glass, furniture, and more. Artists generally prohibited photography. You will either have to take me at my word when I say the pieces were stunning or visit for yourself. The next festival take place February 8 to 10, 2019. Hours are 10 am to 5 pm. Admission is $3. Thunderbird Artists produce other festivals in the greater Phoenix area: Carefree Fine Art & Wine Festival, Arizona Fine Art Expo, Surprise Fine Art & Wine Festival, Fountain Hills Fine Art & Wine Affaire. I have to admit, my first thought was…’Huh? 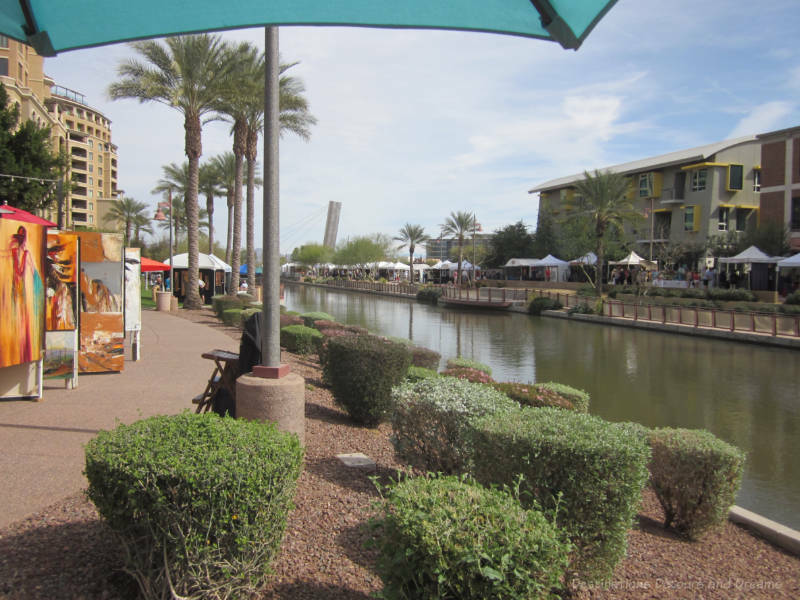 Waterfront in Scottsdale?” So I appreciate the explanation about the ancient canal being part of a sophisticated irrigation system built by the Hohokam Indians over a thousand years ago! But any wine and art festival looks and sounds like great fun! The history of the canal system is fascinating. The festival is a lot of fun. Hi Donna, the waterfront sounds a lot like the San Antonio river walk. It looks beautiful. I love the weather in Arizona this time of year. It’s darn near perfect. Festival sounds like tons of fun for $3! I suspect the San Antonio river walk (which I love by the way) was one of the inspirations for the development of the Scottsdale waterfront. I’ve been to Scottsdale many times to visit my father and therein lies the problem. I always do the same things so it wasn’t until a trip last December that I realized how extensive the canals were and what a great area there was to investigate in downtown Scottsdale. The art and wine show would be fun to see. There is so much to see and do within Scottsdale alone, more when you consider the greater Phoenix area. But spending time with family is more important than exploring the world. It’s nice if you can do a bit of both, but it doesn’t always work out that way. I, too, would like to visit this festival on a trip south sometime. It looks like it would be a good time. Great info! I’ve pretty sure you’d like it (and the other art festivals/shows put on by this group). This looks like a fun way to explore the area and a canal (who knew) and a festival to boot, excellent post. Thanks Noel. The way Scottsdale has developed the canal through its downtown is pretty cool! Oh, Donna. This looks like my kind of event — if they throw in a little chocolate! It’s been a long time since I’ve been to Scottsdale. I think it’s time for another visit! 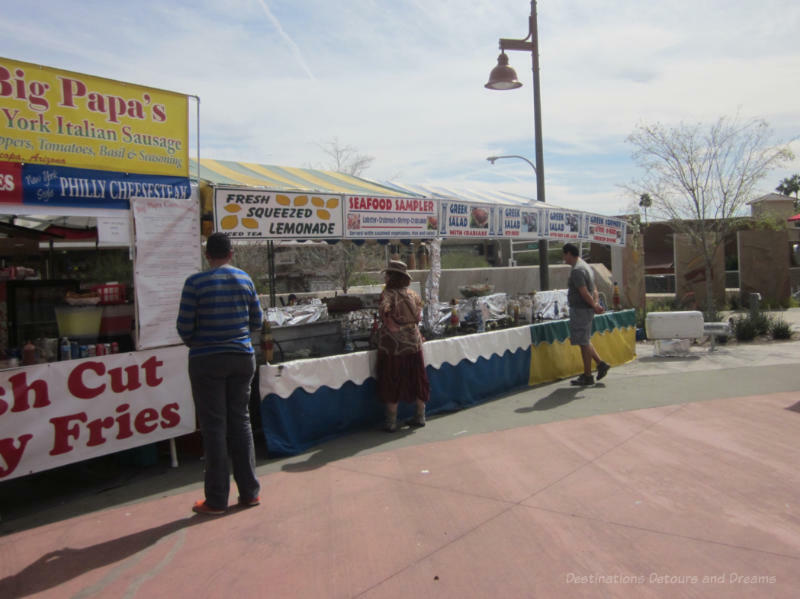 Doreen – there are some fine chocolate stands as well. I don’t remember there being many, but there were at least a couple when I attended in spring. 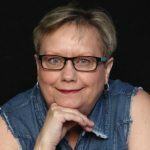 Donna – Its been a while since we were in Scottsdale, but I didn’t know about the water! It is a lovely city and the desert is always so picturesque. 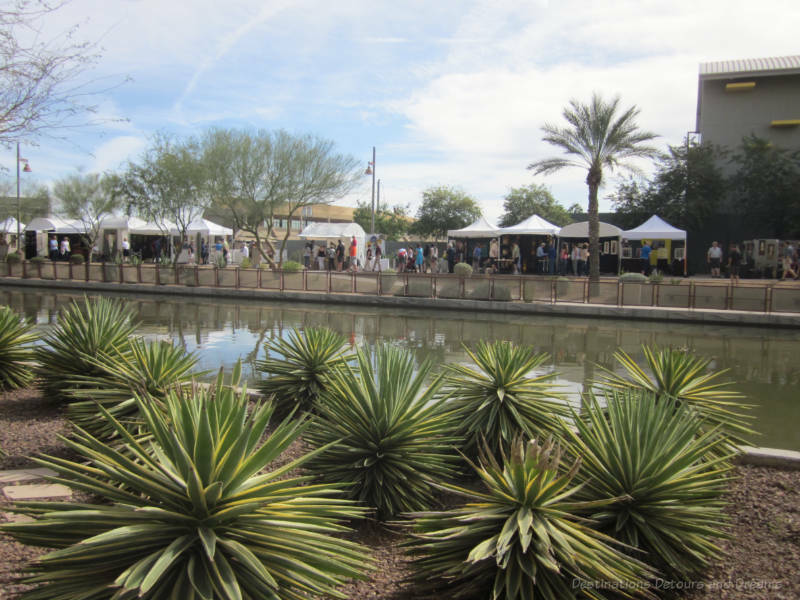 The Scottsdale Waterfront has only been developed in the last 10 years or so, although the canal system dates back a thousand years. I love the desert scenery around the Phoenix area. You write about things around this area I never knew existed! Thanks for all the info. I was here 6 months last winter and will spend another 6 months this time. 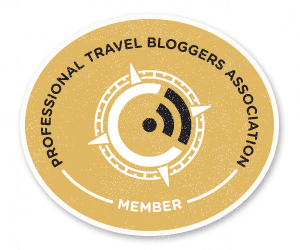 Hope to see some of the things you go to and write about! There is a lot to see and explore in the area. Have fun. Looking forward to meeting you in person. 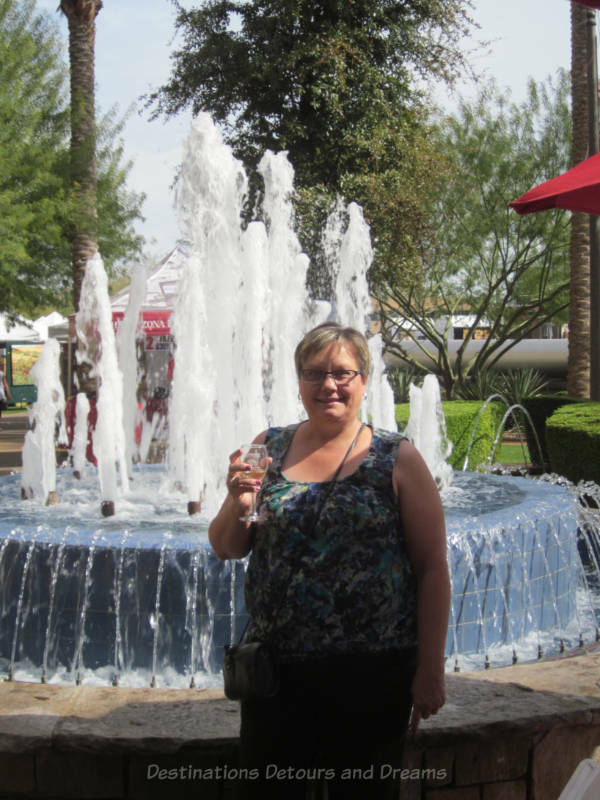 I love attending festivals and the Waterfront in Scottsdale looks like a beautiful place to admire art, sample wine and listen to the music. 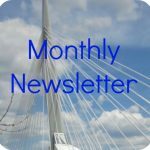 So much to see and do as well as select some gifts for the holiday season! Wine and art makes a perfect combination. 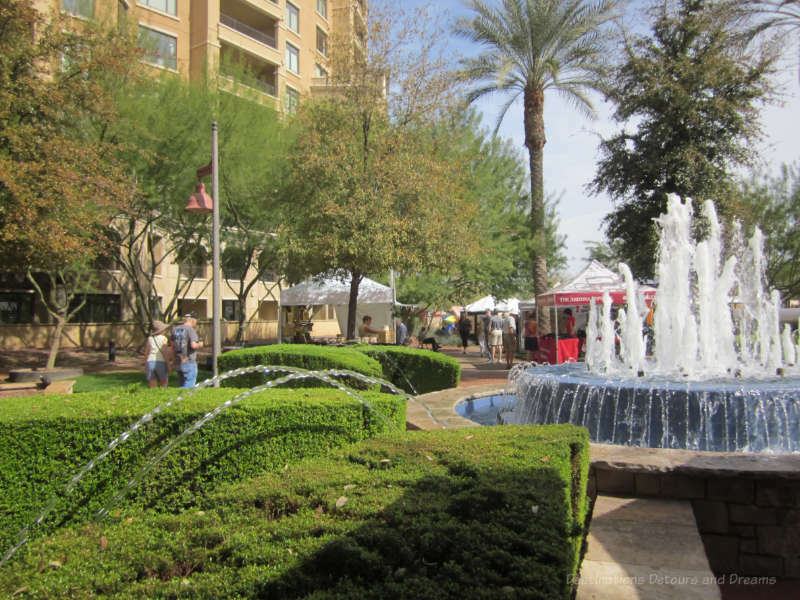 And the Waterfront area of downtown Scottsdale and its ancient canal sounds like a fascinating setting to enjoy both. Yes, indeed. A great combination in a great setting. Art and wine – what a great combination! And it looks a lovely town to wander around. It is a great combination. And a nice area to wander around, even outside of the festival area. 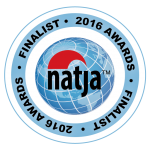 I’ll add this one to our list, should we be in Scottsdale/Phoenix at the right time next year! Great information! Thunderbird artists sponsor other art festivals as well, so there is a good chance one of them is on when you visit. I agree about the waterfront – and you don’t find many of those in the desert. Add me to the list of people who didn’t know Scottsdale had a waterfront. Water and wine for $3? Sign me up! $3 gets you in. It’s another $10 for the wine tasting – still a pretty good deal. Scottsdale is so beautiful. Add to that a festival and what’s not to love!?!! Your photos are great! Thanks Marilyn. There is certainly lots to see and do in Scottsdale. It does make for a fine afternoon. I’ve never been to Scottsdale, but if I do visit it sounds like the Waterfront Fine Art & Wine Festival would be the time to go. The festival is fun, but I’m sure you’d find lots of things to see and do in Scottsdale at other times as well.